The formation and degradation mechanisms of paired helical filaments (PHF) are still unclear. A study of these phenomena was undertaken using a specific anti-PHF immune serum. Tau proteins are the major antigenic components of PHF (as demonstrated by immunoblotting and immunocytochemistry using anti-PHF and anti-tau immune-sera). Moreover, we have studied the distribution of tau proteins in the different regions of a normal human brain. The anti-PHF strongly detected tau proteins on immunoblots of protein extracts from cortical gray matter, but these proteins were weakly labeled in cortical white matter extracts and almost absent in spinal cord extracts. This distribution of tau proteins, essentially in cortical gray matter of human normal brain, correlates well with the distribution of PHF-containing structures (neurofibrillary tangles, NFT) and degenerating neurites at the periphery of senile plaques (SP) in the cortex with Alzheimer’s disease. 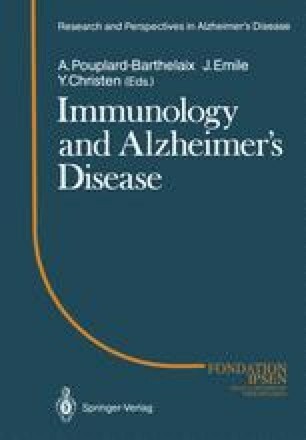 Using simultaneous immunolabeling of PHF and elective staining of amyloid deposits by thioflavine, the relationships between PHF and the amyloid substance were studied. Degenerating neurites containing PHF are concentrated like a sleeve around certain pathological vessels with amyloid angiopathy (PHF/AA lesions). PHF/AA lesions seem to be formed by a toxic material brought from blood vessels, leading to the degeneration of surrounding neurites in their close vicinity and provoking the aggregation of tau proteins in PHF. The pathogenesis of such lesions is perhaps similar to the formation of SP containing a capillary in their center. A comparison of the distribution of PHF and amyloid substance was also performed. In neuronal perikaryons, different populations of NFT were observed, strongly immunolabeled and weakly thioflavine-stained tangles or weakly immunolabeled but strongly thioflavine-stained tangles. Ghost tangles, which correspond to disintegrated NFT, were often exclusively thioflavine-stained. Thus, it is likely that NFT progressively acquire the tinctorial amyloid properties. These observations argue for a catabolism of PHF bundles into an amyloid substance which seems different from other amyloid deposits found in the central core of neuritic plaques and vessel walls.